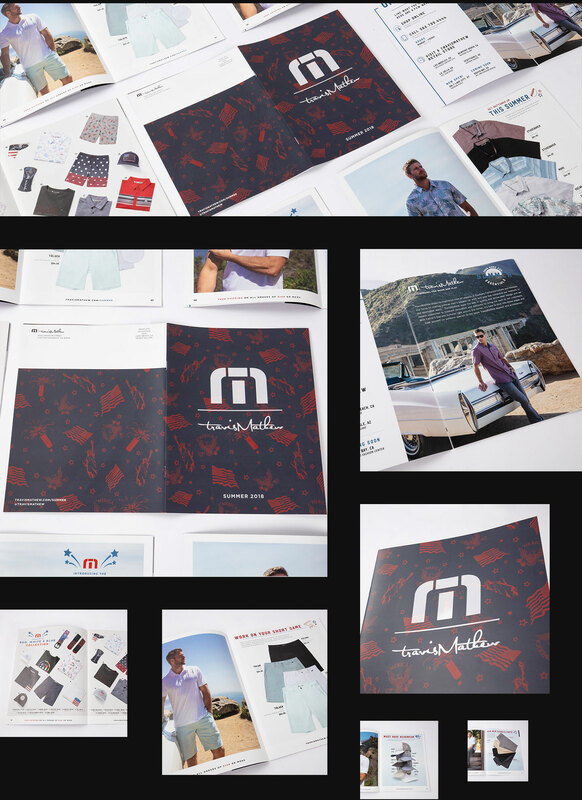 For the past 3 seasons I have had the priviledge of leading creative, coordinating and implementing all TravisMathew publications. This includes the main line catalogs, as well as DTC (Direct To Consumer) mailers. Both of these project sets require prompt coordination from multiple departments as well as in depth scheduling beginning with creative concept & creative direction and ending with final press checks and delivery. These projects tend to be the most in depth and work intensive as it not only requires a sharp creative eye to capture the seasonal aesthetic but also the ability to translate the desires of each department executives individual needs. Each season, TravisMathew requires an updated mainline catalog to display and curate the upcoming styles in a clean and efficient fashion. The design aesthetic and photography for each catalog must be curated in a way that complements and amplifies the clothing styles developed for that particular season. Color pallets, textures, and typography are all captured from early developed CADs & mood boards and enhanced for the catalog in order to paint a more complete picture once the salesman opens each spread for the client. Each season has a theme which can vary based upon the time of the year and the artistic direction the clothing designers have chosen. It is essential to carry this theme throughout to complete a narrative. Once established in print this defined theme will be further carried through to web, advertising, and e-commerce assets over the next 12 months. TDC Mailers or Direct To Consumers Mailers are publications created for the sole purpose of engaging both existing and cold leads through physical advertising. Generally, each mailer has the most up to date clothing line with a select few styles which are SMU or Special Markup Units, SMU’s are developed for product and consumer testing and are produced in much smaller quantities than mainline pieces. These SMU’s are prominently featured within each mailer and are generally given there own spreads. As with the mainline catalogs the aesthetic is derived from the season and the artistic direction the clothing designers have designated. This direction is then enhanced into a more overarching aesthetic for print in order to expand the canvas for each piece. Once creative direction has been developed and establed for print it is then translated for various web and marketing assets.